Every day is Black Friday here at Calder Screen Print! Our fantastic deals on band t shirt printing means we offer the best deals all year round. All our band merch is printed in house on the best quality garments and is available with a very quick turnaround. So, forget the Black Friday deals and come to Calder Screen Print for your band t shirts printed affordably and quickly get in touch with us now! It’s another busy week here at Calder Screen Print! Coming up to the Christmas season we’ve been inundated with requests for band t shirts printed. Due to our fast and efficient print methods & large capacity we are able to print band t shirts quickly & at a very affordable price. Autumn is upon us! In an attempt to brighten up the darkening nights, we thought it would be a cool to share a video of our new screenroom artwork. Daniel Howden has done a fantastic job of painting the walls in his own unique style and we love it and we are sure you will too! The new screenroom is a fantastic asset to us as it allows us to create more detailed screens, faster and more efficiently. This allows us even more flexibility clients wanting band t shirts printed or any kind of t shirt printing you may require. When upcoming indie band The Kaizens wanted their band T shirts printed they knew the perfect company for the job was us at Calder Screen Print! We’ve printed band t shirts for hundreds of bands of all sizes and genres for almost 20 years. The band wanted an affordable run of band t shirts printed using their band artwork, the band t shirts were then printed onto high quality, heavy duty cotton T shirts. 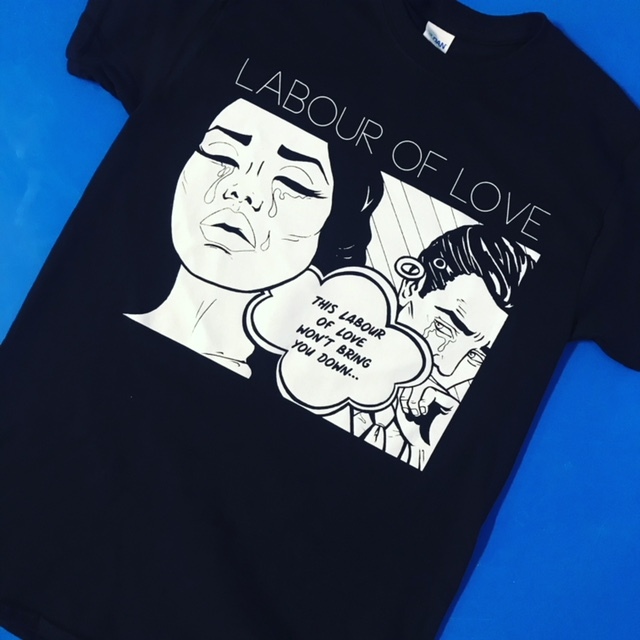 Screen printing the band t shirts gives us great flexibilty in that we can print the band artwork onto t shirts of different colours and sizes at no extra cost to the band, we even provide free screens!